Mogánite: Mineral information, data and localities. After the type locality: Mogán, Grand Canary Island, Spain. 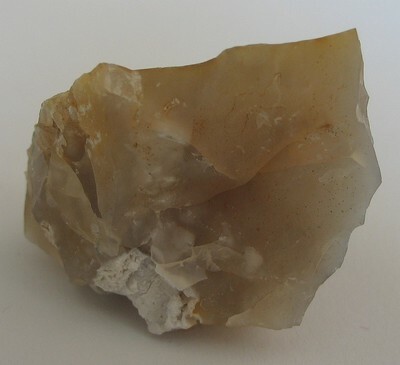 This SiO2 modification is not uncommon as a minor component of finely crystalline chalcedony (as well as chert or flint), although some samples may contain up to about 50 vol.% of moganite. It may be identified by careful powder diffraction analysis or Raman and infrared spectroscopy. Chalcedony 13 photos of Mogánite associated with Chalcedony on mindat.org. Flörke, O.W., Jones, J.B., Schmincke, H.-U. (1976) A new microcrystalline silica from Gran Canaria. Zeitschrift für Kristallographie: 143: 156-165. Flörke, O.W., Flörke, U., Giese, U. (1984) Moganite, a new microcrystalline silica-mineral. Neues Jahrbuch für Mineralogie, Abhandlungen: 149: 325-336. Dunn, P.J. (1985) New mineral names. American Mineralogist: 70: 874. Miehe, B., Graetsch, H., Flörke, O.W., Fueß (1988) Die monokline Kristallstruktur des SiO2-Minerals Moganit. Zeitschrift für Kristallographie: 182: 183-184. Miehe, G., Graetsch, H. (1992) Crystal structure of moganite: A new structure type for silica. European Journal of Mineralogy: 4: 693-106. Jambor, J.L. (1993) New mineral names. American Mineralogist: 78: 677. Kingma, K.J., Hemley, R.J. (1994) Raman spectroscopic study of microcrystalline silica. American Mineralogist: 79: 269-273. Götze, J., Nasdala, L., Kleeberg, R., Wenzel, M. (1998) Occurrence and distribution of " moganite " in agate/chalcedony: a combined micro-Raman, Rietveld, and cathodoluminescence study. Contributions to Mineralogy and Petrology: 133: 96-105. Parthasarathy, G., Kunwar, A.C., Srinivasan, R. (2001) Occurrence of moganite-rich chalcedony in Deccan flood basalts, Killari, Maharashtra, India. European Journal of Mineralogy: 13: 127-134. Rodgers, K.A., Cressey, G. (2001) The occurrence, detection and significance of moganite (SiO2) among some silica sinters. Mineralogical Magazine: 65: 157-167. Moxon, T., Rios, S. (2004) Moganite and water content as a function of age in agate: an XRD and thermogravimetric study. European Journal of Mineralogy: 16: 269-278. Schmidt, P., Bellot-Gurlet, L., Slodczyk, A., Fröhlich, F. (2012) A hitherto unrecognised band in the Raman spectra of silica rocks: influence of hydroxylated Si–O bonds (silanole) on the Raman moganite band in chalcedony and flint (SiO2). Physics and Chemistry of Minerals: 39: 455-464. Schmidt, P., Bellot-Gurlet, L., Lea, V., Sciau, P. (2013) Moganite detection in silica rocks using Raman and infrared spectroscopy. European Journal of Mineralogy: 25: 797-805. Zhang, M., Moxon, T. (2014) Infrared absorption spectroscopy of SiO2-moganite. American Mineralogist: 99: 671-680. Zhu, T., Xin, L., Fang, A., Li, W., Wang, X., Lou, X., Zhang, M. (2017) A review of research on a new silica polymorph-moganite. 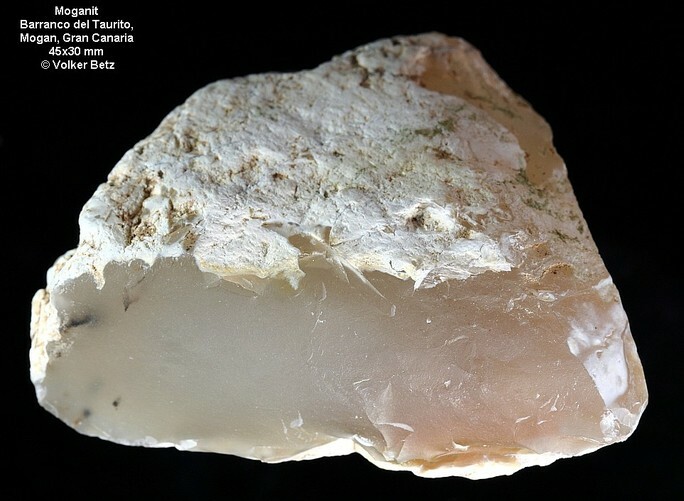 Acta Mineralogica Sinica: 37: 159-167.
ⓘ Boa Vista mine ? Koníčková Š., Losos Z., Hrazdil V., Houzar S., Všianský D. (2016): Mineralogie „očkových“ opálů z Nové Vsi u Oslavan (moldanubikum, Český masív). Bulletin mineralogicko-petrologického oddělení Národního muzea v Praze 24, 1: 144-158. G. Demarcq, 1973, "Guides Géologiques Régionaux : Lyonnais, Vallée du Rhône" , p. 88, Masson. F. Roulin et al. , 1986, 109, pp. 349-357. Rodgers, K.A., Cressey, G. (2001) The occurrence, detection and significance of moganite (SiO₂) among some silica sinters. 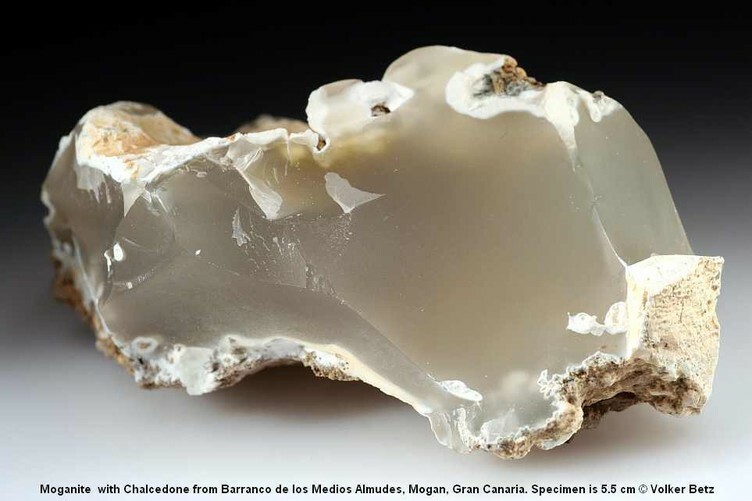 Mineralogical Magazine, 65:2, 157-167. American Mineralogist (1993): 78: 677.